If you're looking for a great (and cheap!) hotel in Toronto, CheapTickets is the best place to find them. We offer deals on the best 666 hotels throughout Toronto. No matter what you're looking for, we have options for you. Grab great rates on the 299 affordable 3-star hotels that are easy on the wallet without sacrificing comfort. Looking for more luxury? Try one of the 169, 4-star hotel accommodations in Toronto. No matter your budget needs, we've pulled out all the stops to make sure you have plenty of vacation options. Maybe you prefer to search for your hotel deals based on what each hotel offers? For example, let's say you just want to find a hotel or resort that has a pool to cool off in after a long day exploring Toronto. Scroll down to choose from the 218 hotels in Toronto that has a pool for guests. Or search for deals on Toronto hotels offering free wifi or breakfast, non-smoking rooms, and more! CheapTickets is here to be your personal travel agent for your next trip to Toronto. Get booking today! What hotels in Toronto offer free wifi access? Are there deals on Toronto hotels offering free breakfast? Yes! The only thing better than finding a great deal on a cheap hotel in Toronto is finding one that offers free breakfast. Grab some eggs, a waffle, or some healthy oatmeal before a day full of exploring Toronto and all that it has to offer. Below are just some of the many hotels that offer free breakfast in Toronto. Toronto Don Valley Hotel and Suites is a 3.50 star rated hotel property in Toronto that offers free breakfast. Super 8 by Wyndham Downtown Toronto is a 2.00 star rated hotel property in Toronto that offers free breakfast. Holiday Inn Toronto - Int'l Airport is a 3.50 star rated hotel property in Toronto that offers free breakfast. 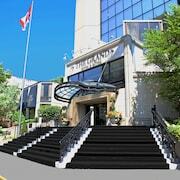 The Grand Hotel & Suites Toronto is a 4.00 star rated hotel property in Toronto that offers free breakfast. What about deals on pet-friendly hotels in Toronto? Toronto is a great place to get outside and explore with your pets in tow so don't leave your furry friends behind. Below you'll find great deals on hotels in Toronto that allow pets. Don't forget to bring plenty of treats! Sandman Signature Mississauga Hotel is a popular, pet-friendly, 4.00 star hotel in Toronto. 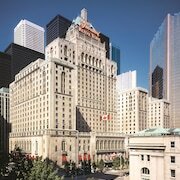 The Fairmont Royal York is a popular, pet-friendly, 4.00 star hotel in Toronto. Hyatt Regency Toronto is a popular, pet-friendly, 4.00 star hotel in Toronto. Thompson Toronto is a popular, pet-friendly, 4.50 star hotel in Toronto. Any good rates on Toronto hotels with restaurants? Absolutely. Don't want to deal with planning our all your meals on your trip to Toronto? We don't blame you. Keep the hangry away by staying in one of the 144 hotels that have restaurants. With a room at one of these spots, all it takes to get a good meal is hopping in the elevator. Check out some of the most popular hotels in Toronto that have restaurants below. 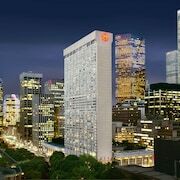 Book Toronto Marriott City Centre HotelToronto Marriott City Centre Hotel is a 4.00 star hotel and has one or more restaurant options. Book Sheraton Centre Toronto HotelSheraton Centre Toronto Hotel is a 4.00 star hotel and has one or more restaurant options. Book Toronto Marriott Bloor YorkvilleToronto Marriott Bloor Yorkville is a 4.00 star hotel and has one or more restaurant options. Book Town Inn Suites TorontoTown Inn Suites Toronto is a 3.50 star hotel and has one or more restaurant options. What are the cheapest hotels in Toronto with pools? What's better after a long day exploring Toronto then a relaxing dip in a pool? Finding the Toronto hotel you need for a bargain! Cool off and unwind at one of our 218 Toronto hotels with a pool. Browse some of the top deals on these hotels and resorts with pools in Toronto below, but be warned: You may not want to check out! Residence Inn Toronto Downtown / Entertainment District has a pool and a 3.00 star rating. Courtyard by Marriott Toronto Markham has a pool and a 3.00 star rating. DoubleTree by Hilton Toronto Airport West has a pool and a 3.50 star rating. Sheraton Gateway Hotel In Toronto International Airport has a pool and a 4.00 star rating. What hotels in Toronto offer parking for guests? Once you've made your way to Toronto, the last thing you want to deal with is finding parking close to your hotel. Avoid the hassle of parking around the block and carrying your luggage all the way to the lobby by booking one of our hotels with parking. Check out deals on some of the 302 hotels in Toronto that offer parking for guests. Monte Carlo Inn - Brampton Suites This hotel has a 3.00-star rating. Le Germain Hotel Maple Leaf Square This hotel has a 4.00-star rating. One King West Hotel & Residence This hotel has a 4.00-star rating. Delta Hotels by Marriott Toronto Airport & Conference Centre This hotel has a 3.50-star rating. Do Toronto hotels offer 24-hour concierge services? When you're on vacation, things don't always go according to plan. Travel with peace of mind when you book one of our 92 hotels in Toronto with 24-hour concierge service. That way you know help is always phone call or elevator ride away. 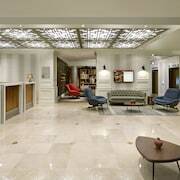 Try Courtyard by Marriott Downtown Toronto. It's a 3.50 star rated hotel in Toronto that offers concierge services 24 hours a day. Try Four Points by Sheraton Toronto Airport. It's a 3.50 star rated hotel in Toronto that offers concierge services 24 hours a day. Try The Omni King Edward Hotel. It's a 4.50 star rated hotel in Toronto that offers concierge services 24 hours a day. Try Bond Place Hotel. It's a 3.50 star rated hotel in Toronto that offers concierge services 24 hours a day. What about low rates on non-smoking hotels in Toronto? Quality Inn & Suites This hotel has a 2.50-star rating. Novotel Toronto North York This hotel has a 3.50-star rating. Cambridge Suites Hotel - Toronto This hotel has a 4.00-star rating. 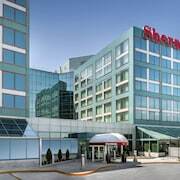 Sheraton Gateway Hotel In Toronto International Airport This hotel has a 4.00-star rating. What are the cheapest Toronto 3-star hotel deals? Our 3-star hotels bring you quality accommodations at a lower price point for the perfect, budget-friendly vacation in Toronto. With 299 3-star hotels throughout Toronto to choose from, you still have options. Browse our selection below. Chelsea Hotel- Toronto. Eaton Centre shopping, Queen&#39;s Park, and Toronto&#39;s thriving theater scene, with its famous Elgin Theatre, are all within 3 blocks of this stylish, family-friendly hotel in the heart of downtown. Toronto Don Valley Hotel and Suites. This family-friendly Toronto hotel is located in the entertainment district, within 1 mi (2 km) of Aga Khan Museum and Ontario Science Centre. Toronto Botanical Garden and Edward Gardens are also within 3 mi (5 km). DoubleTree by Hilton Hotel Toronto Downtown. This contemporary Toronto hotel is 1 block from the Art Gallery of Ontario, 3 blocks from both Eaton Centre and the Royal Ontario Museum, and 5 blocks from the harborfront. 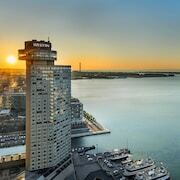 Delta Hotels by Marriott Toronto Airport & Conference Centre. This family-friendly Toronto hotel is located near the airport, within 3 mi (5 km) of Toronto Congress Centre, Fantasy Fair and Woodbine Centre. Woodbine Racetrack is 3 mi (4.8 km) away. What are the best deals on 4-Star Hotels in Toronto? Toronto is full of hotels and it can be hard to narrow down where you really want to stay. Luckily, we've done that hard work for you be narrowing you from 666 hotels throughout Toronto, to the 169 4-star hotels in Toronto. Our 4-star hotels in Toronto are exactly what you need for your next family trip, romantic weekend, or solo getaway. Check out our most popular deals below. The Grand Hotel & Suites Toronto: This Toronto hotel is 3 blocks from Eaton Centre mall, 5 blocks from St Lawrence Market, a half-mile from the financial district, and 1 mile from the convention center. Cambridge Suites Hotel - Toronto: This contemporary, all-suite Toronto hotel surrounded by entertainment and shopping at the Eaton Centre, is within 2 blocks of Massey Hall and Canon Theatre, and within 5 blocks of Air Canada Centre. 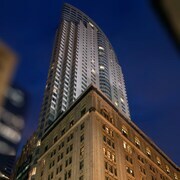 One King West Hotel & Residence: Conveniently located at the corner of King and Yonge streets, One King West connects you to Toronto’s downtown business, entertainment, and shopping districts. Le Germain Hotel Maple Leaf Square: Located in Downtown Toronto, this romantic hotel is within a 10-minute walk of Steam Whistle Brewing, Air Canada Centre, and Rogers Centre. CN Tower and Hockey Hall of Fame are also within 15 minutes. What are the best activities to do in Toronto? Small-Group Beer Makes History Better Tour: Starting at just $37 per person. Small-Group Kensington Market & Chinatown Tour: Starting at just $29 per person. Marineland of Canada Tickets: Starting at just $40 per person. Niagara-on-the-Lake Wine Tour & Gourmet Lunch: Starting at just $121 per person. No matter what time i checked in they always have a room ready for me. The condition of this hotel was way better compare to the other hotels with similar price. It is so classy and old fashioned and clean and the pool and rooftop jacuzzi was super! Also the doorman Tak and Phil were extremely generous and helpful! I will come to this hotel again when I visit Toronto next time!